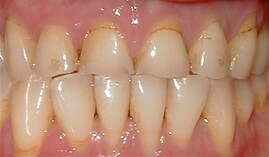 A female patient was concerned with the significant wear on her front teeth. Crown were recommended to enhance the appearance of her front teeth as well as prevent any further wear on her teeth in the future. Crowns were placed on her front six teeth and a more natural shade was selected. 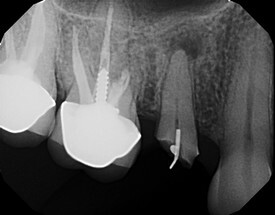 BEFORE: An older male patient fractured the front part of his tooth on the upper right. The tooth had a large silver filling in it already. 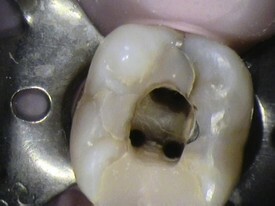 The best prognosis for this tooth long term was to place a crown (cap) on it. 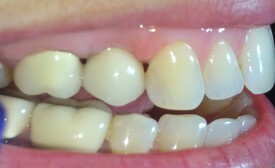 AFTER: The new crown (cap) was placed on the tooth to restore it's original shape, color, and chewing function. BEFORE: A female patient had a space in her upper right due to a tooth that broke and needed to be removed (see the case in the oral and maxillofacial surgery section of the smile gallery). An implant was placed in the area where the tooth was missing. 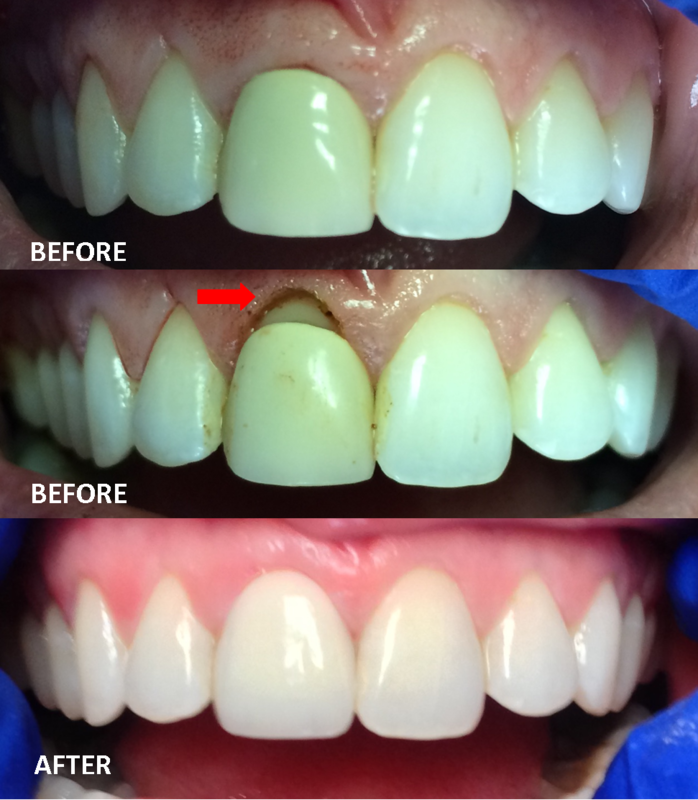 AFTER: A crown was placed on the implant a few months later to restore the patient's smile and chewing ability. 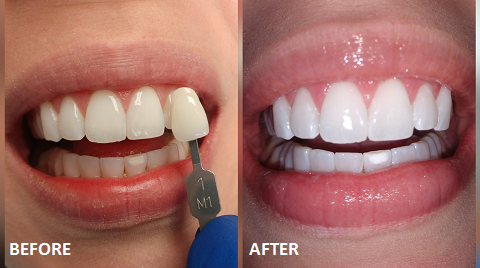 One hour in-office whitening brightens teeth an average of 6 shades lighter! 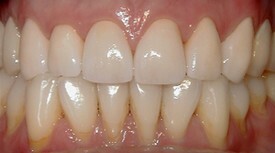 A female patient wanted to replace an older crown that was darker than the other front teeth. 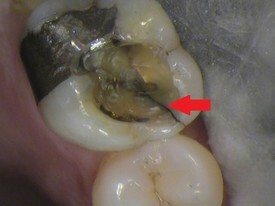 The tissue above the crown was recontoured first (red arrow) to be more symmetrical with the other front tooth. Then the old crown was removed and replaced with a porcelain crown that more closely matched the other front teeth. 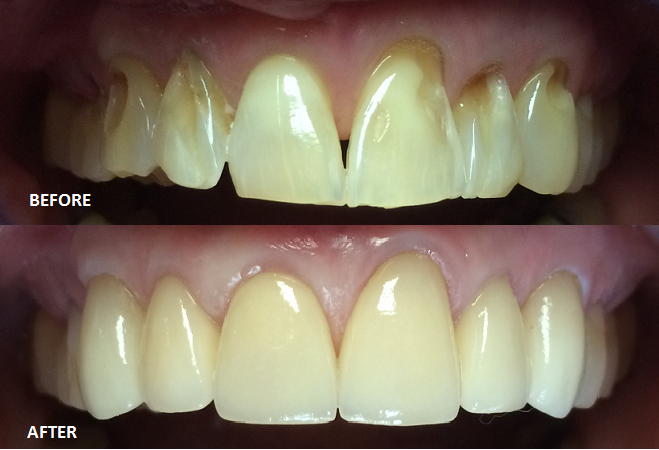 An older female patient wanted to enhance the appearance of her front four teeth while staying within a budget. We accomplished this by making crowns (caps) for her two front teeth, a tooth-colored filling on another tooth, and lightly recontouring the remaining front teeth to create a nice, even appearance. A patient presented with pain on a molar tooth. 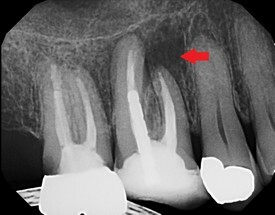 A before x-ray revealed an infection in the tooth (the large dark space indicated by the red arrow). 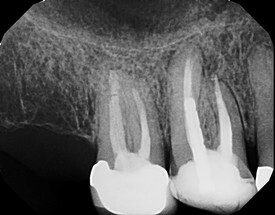 The second x-ray shows the completion of the root canal 2 weeks later. The third x-ray shows the same tooth 6 months later. 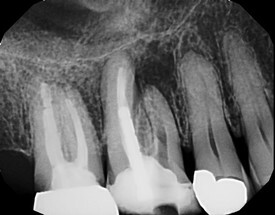 The patient was no longer in pain and the infection (dark space) has disappeared underneath the tooth. A male patient complained of pain in a lower right molar. A large cavity (red arrow) was observed that caused the nerve to become exposed. A root canal was performed to remove the nerve and relieve his pain. 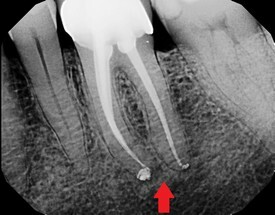 A view from the top of the tooth using an intraoral camera shows the channels in the tooth where the nerves of the tooth used to reside. Once the nerves are removed, the channels are filled with a material to keep any bacteria or irritants from causing future problems. The final x-ray reveals this technique, and the patient was free of pain. A patient had pain on an upper molar. 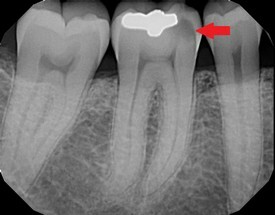 An x-ray revealed an infection around the root of a tooth that had a previous root canal (red arrow showing a dark void). The old root canal material was removed, the canal cleaned, and re-filled with new material. 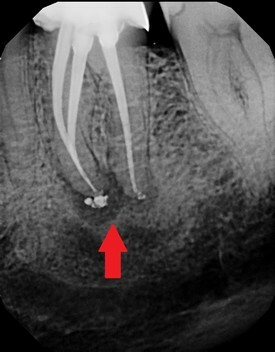 The dark area around the root of the tooth where the infection was can no longer be seen, and the patient is experiencing no more discomfort. A patient complained of pain to biting and cold sensitivity on the upper right. A fracture below an old filling was suspected. 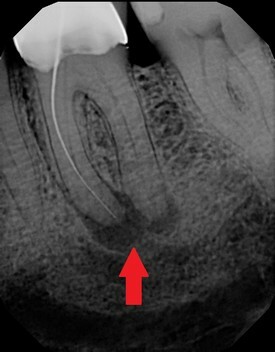 Upon removal of the old filling, a very visible fracture line was seen running down the tooth (red arrow). The fracture went in to the nerve of the tooth. 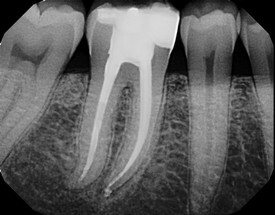 A root canal was needed to relieve the pain, followed by a crown (cap) to keep the fracture from running any deeper and compromising the tooth. 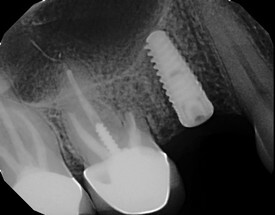 This patient had a tooth that broke off in the upper right. What was left of the tooth could not be restored. 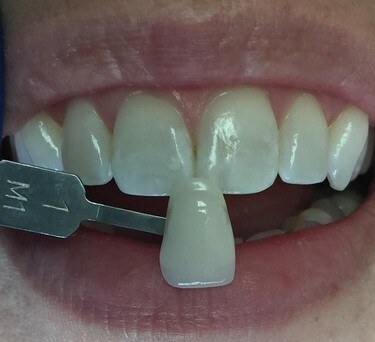 After the tooth was extracted and allowed to heal, an implant was placed in the bone underneath the gum tissue (see the result of the case in the "Restoration" section of the Smile Gallery). An older male patient broke a tooth on the bottom left that required a crown. In honor of his daughter, a Penn State University Alumni, he requested a Penn State nittany lion logo for the crown. It was a fun case for us, the patient, and the lab. Although it is on the farthest tooth back and not easily seen, it is an interesting conversation piece nonetheless. 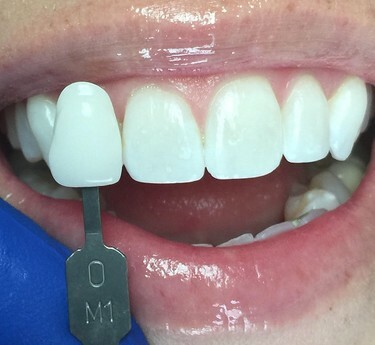 BEFORE: A female college student asked about making the gum tissue around her upper front teeth look symmetrical. The tissue was trimmed using an electrical surgical instrument. The procedure took less than 5 minutes. AFTER: Two weeks later the patient was happy with the results showing her front teeth appearing the same length on the right and left side.